Beautiful 4 bedroom/2 bath home located on Lake Brownwood. There are 2 levels inside the home with a loft upstairs and a large back porch overlooking the lake. Take the steps down to an oak-shaded deck with a grill/smoker and private boat dock where you can fish or swim. We provide a soothing get-away for family and friends looking for the quiet solitude of a lake environment. 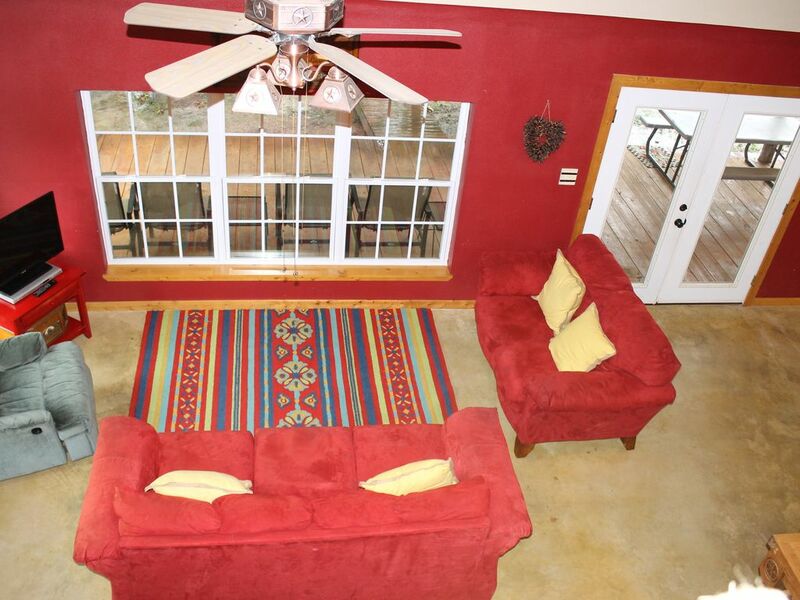 Beautiful, fully furnished four-bedroom, 2-bath home on open water. One king master, one queen bedroom and two bathrooms downstairs. Upstairs bedroom 1 has a brand new queen bed and one twin bed. Bedroom 2 has a brand new queen bed and one twin bed. Loft includes two twin beds and a sofa-sleeper. Large open living area. Utility room with washer and dryer are located downstairs. Outside enjoy the large live oaks, boat dock, jet ski lift. Build a fire in the fire pit and enjoy smores while overlooking the lake. Beautiful view and large backyard for washers, horseshoes, and other outdoor activities. Looking to get out on the water, call Lake Brownwood Boat Rentals for the newest model pontoon boats or ski boat for the day. (325) 305-2220. Conveniently located 5 miles from State Park boat ramp. Enjoy playing golf? The beautiful Hideout Golf Course is located 15 miles away. It is a well manicured 18-hole course. Enjoy live music? Wild Duck Marina is less than a 5-minute boat ride across the lake. This is a smoke and pet free home. Well maintained and supplied with everything you need. Kitchen supplied with all items needed. Very rough driveway due to rain drainage. Unavoidable. We would recommend this cabin and will be back in the future.Thank you so much. It is a very nice place to stay and everything, it would be even better if it was cleaner, but besides that, it was very nice, close to the lake, very beautiful view, even thinking about going back again. Roomy, comfortable, perfect get away! Very nice place was comfortable and cool.